If you’re on a low carb or keto diet you probably already know that zucchini is included in many low carb or keto recipes. With only 6 grams of carbs per medium zucchini it’s a great vegetable for those following a carb-conscious diet. But . . . Raise your hand if you’ve tried every zucchini recipe on Pinterest. Yep. Me, too. Zucchini is a versatile veggie, for sure. I’ve mostly had zucchini sliced or shredded. And, of course, I learned early on in my gluten-free days how to make zoodles. However, zucchini is usually relegated to side-dish status in most low carb recipes. When you’ve got a ton of zucchini from the garden in late summer, though, you need a recipe that uses as much zucchini as possible while minding the ratio of carbs to protein and fat. Other than sauteed summer squash, I don’t think I’ve made a dish where zucchini is the star. Well, until now, that is. This super easy stuffed zucchini recipe was fun to make (the kiddos can help) and quite delicious. The ingredients are few (zucchini, mild ground sausage, carrots, Parmesan, and salt.) but the flavor is robust. If you’re looking for an easy weeknight meal or a new way to prepare zucchini, this recipe fits the bill! 2. Cook the ground sausage in a pot over medium heat until browned and cooked through. 3. Shred the carrots and combine with the sausage. 8. 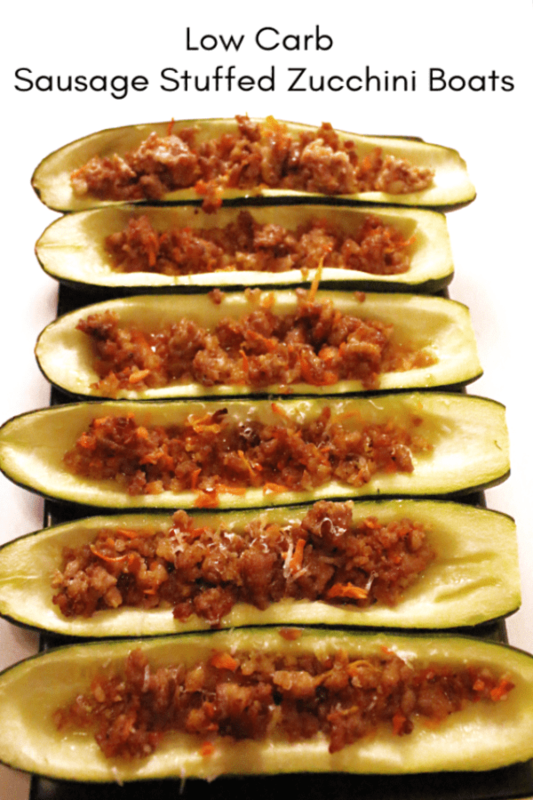 Fill each zucchini half with sausage/carrot mixture. 9. Bake for 30 minutes, or until zucchini is soft enough to eat. 10. Top with shredded Parmesan and serve. Cook the ground sausage in a pot over medium heat until browned and cooked through. Shred the carrots and combine with the sausage. Fill each zucchini half with sausage/carrot mixture. Bake for 30 minutes, or until zucchini is soft enough to eat. Top with shredded Parmesan and serve.